This publication contains guidance for preparing plans and specifications and for ensuring the quality of recycled bituminous concrete. In addition, this publication provides useful information to design engineers, laboratory personnel, and inspectors concerning the mix design, plant production, and laydown of recycled pavement mixtures. The emphasis is on airfield pavements, however, the concepts also apply to other pavements. Recycling pavement materials has proved to be a feasible process to rehabilitate worn-out pavements. Since recycled pavements will not always be cost-effective, recycling should be considered as an option when repairing or rehabilitating existing pavements. Learn about heater planing scarifying. This course is intended for civil engineers and other design and construction professionals wanting an introduction to asphalt concrete pavement recycling. This course will give civil engineers and others an introduction to the equipment and methods for recycling asphalt concrete pavement for airfields, streets and highways. 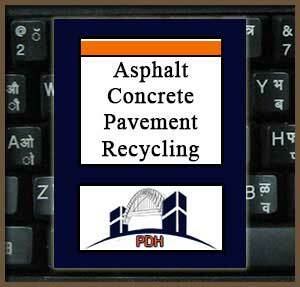 This is an introduction to the methods and equipment employed in recycling asphalt concrete pavement. After completion of this course you will be prepared to evaluate pavement recycling as an option for management of asphalt concrete pavement programs.